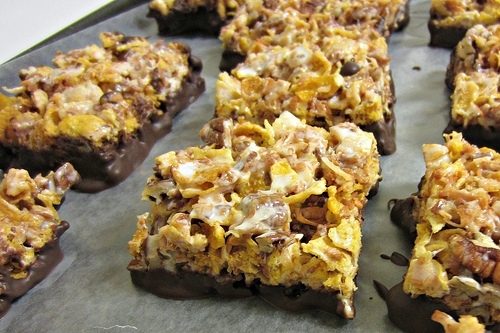 Crispy treats seem to be the name of the game this week. First I see Jeff make some goo-balls on Chopped All Stars … then Bakerella posts her version hours later, which were inspired by these treats at Smitten Kitchen. They have reminded me of the cereal treats I made for edible gifts last Christmas (especially since the Chopped basket had marshmallows and coconut for mystery ingredients). Behold! Toasted Coconut Pecan Treats! The 1st batch was shipped to my sister & her boyfriend. The 2nd batch went to my co-worker… she said her family ate them for breakfast! I was initially inspired by a Martha Stewart Recipe, wanting to make something unique as a Christmas gift for my sister’s Boyfriend. He loves coconut, but my sister does not. So a dessert with coconut is quite an occasion. The tweaks I made to the Martha version seemed very sensible. The 1st batch was pretty good, but I knew it could be better. So, I adjusted the proportions a bit, and DIPPED THEM IN CHOCOLATE. This new version went to my coworker, and her family was very pleased! Here is the updated (dare I say BETTER) recipe for you to try. Your life will be a lot easier if you use a kitchen scale to weigh out your ingredients. You don’t have to weigh everything… it is just that ingredients like pecans and cornflakes can be hard to measure with the scoop method. Spray a 7”x11” Baking Dish with cooking spray. Combine Toasted Coconut, Pecans, and Corn Flakes in a large heatproof bowl. Set aside. Melt butter and marshmallow on the stove over medium heat. Stir constantly (to avoid burning) until marshmallow is a creamy consistency and the butter has been completely combined. Using a wooden spoon or heat-proof spatula, transfer the marshmallow to the cereal mixture. Stir until all ingredients are equally combined. Transfer entire contents of the bowl to the baking dish. Spray some cooking spray on 1 hand so you can press the treats into an even layer. Allow to cool. Cut cooled treats into desired shapes. Hold treats at top edge and dip the bottom into melted chocolate, so the chocolate comes ½ way up the treat. Let excess chocolate drip back into the bowl. Place treats chocolate-side down on a wax-paper lined cookie sheets (any flat surface will work, really) and let the chocolate harden. The original recipe calls for an 8×8 pan, but that makes THICK squares. And 9×13 makes thin squares… any dish that seems bigger that a 8” square but smaller than a 9x13 should work out fine. Don’t know how to toast coconut? Here are some simple instructions! It is not scary. Just don’t abandon the coconut during the toasting process and you will be fine. I you can think of any more fun additions to the traditional Rice Crispie Treat, please let me know!